Such a huge variety of flowers in buckets at the market! I took this photo in early September so it always reminds me of the abundance of late summer. I visit many farmer’s markets through the summer now that every community seems to have one at least once a week, to purchase what my garden is not producing. All the farmers are local and are small family farms and I enjoy meeting the people who grow my food, and who took the time to pick it and sort it and wash it and pack it the day of the market. This particular farmer had buckets and buckets of flowers and in the reflected light from the sky all the flowers were so vibrant I couldn’t pass them up. 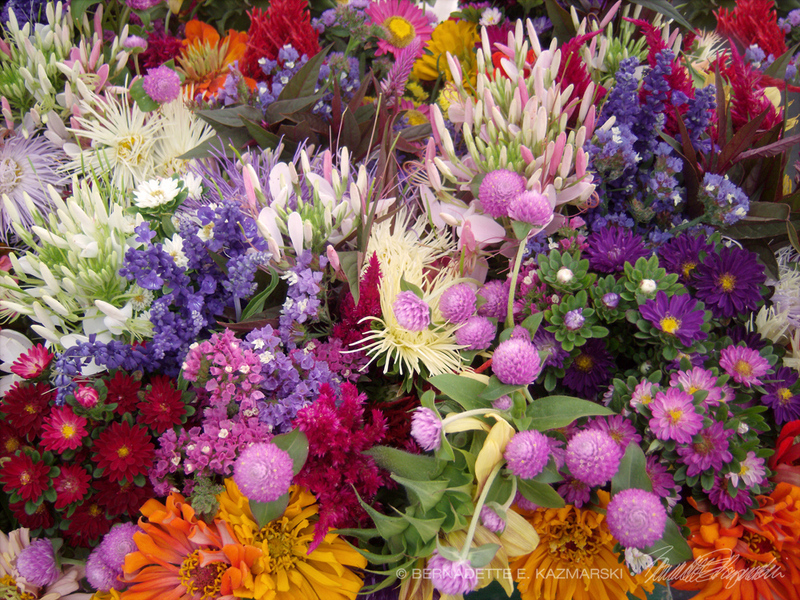 “Market Flowers” is also one of the choices of “new member thank you” prints. You can receive a matted 8″ x 10″ print just for registering for an account. Visit Current New Member Gifts to find out more. I like to frame this photo with a white frame and mat to really set off the flowers, but other custom framing options are also available for a special quote. Framed prints are signed on the photo and on the mat. 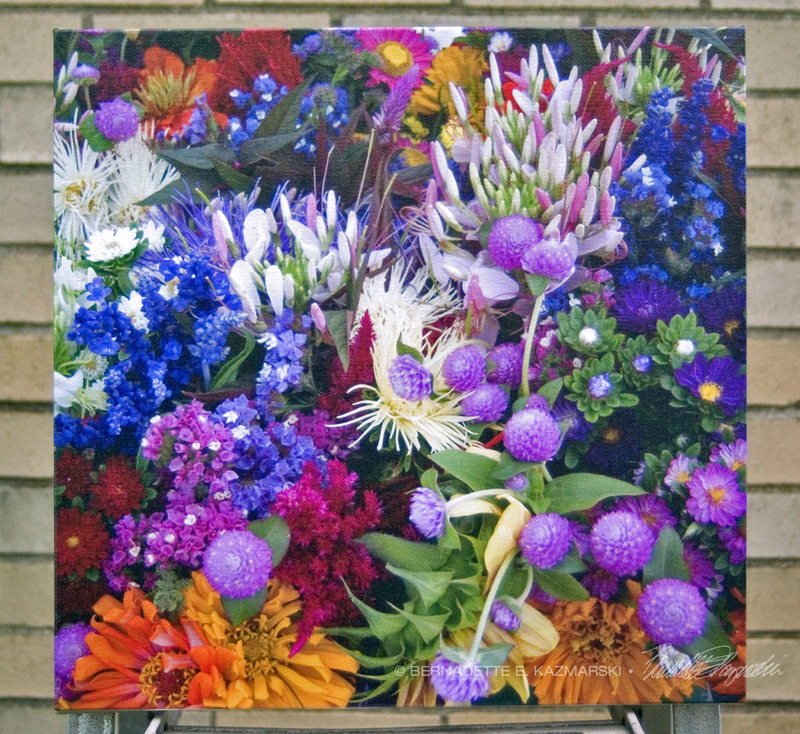 “Market Flowers” looks fantastic a a canvas print no matter what size you get. I usually have at least one of the smaller sizes of canvases on hand, but order larger ones as they are ordered here because customers often want a custom size. Smaller canvases are a 3/4″ in depth, Canvases 12 x 16 and larger are 1-1/2″ in depth. I set them up so the image runs from edge to edge, then the sides are black or white or sometimes I slip in a color that coordinates with the painting. 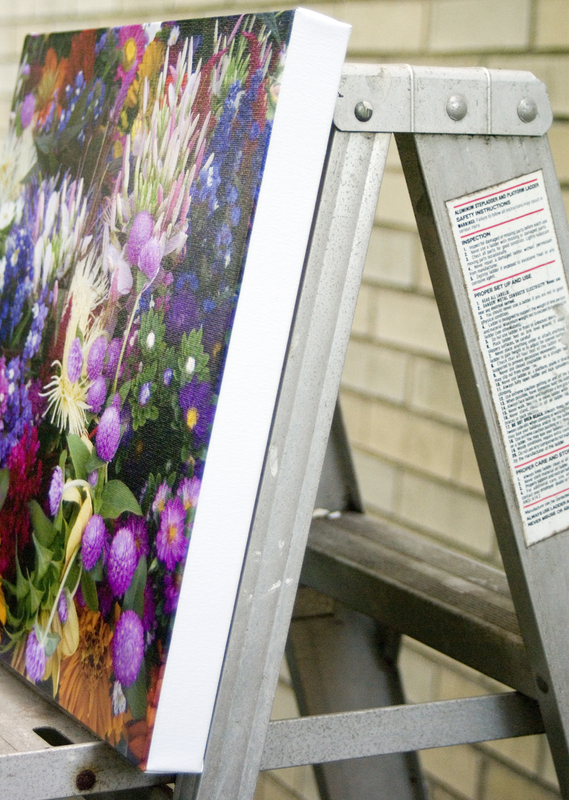 The 14″ x 14″ canvas print is my favorite, just the right size and shape. Sides are finished in white.